Disclaimer:The information given in this FAQ's page is generic. You should verify critical information such as visa-related issues, health and safety, customs and transportation with the relevant authorities prior to traveling. Please be aware that information given in FAQ's may change at any time. In effect, we accept no responsibility for any loss, injury or inconvenience sustained by anyone resulting from this information. For the latest updates, please contact us or our in-country coordinator(s). With this in mind, while setting up volunteer and travel abroad organization, we have selected many safe and culturally rich destinations where volunteers can make meaningful contributions, immerse in local culture, and get enriched from volunteer abroad experience. In each destination, we have carefully selected projects, host families, travel coordinating staff, and placed local support staff. We have provided them with extensive training to manage the program with professional services that will be delivered with care and respect for all volunteers. We are now proud of our coordinators, host families, host projects, and staff as all of them have at least 4 years of working experience with international volunteers. 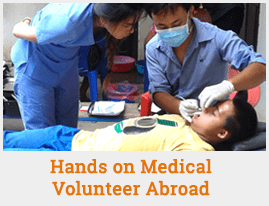 To meet your expectation, they are committed to working hard to meet your expectations, delivering professional services, and turn your volunteer abroad experience into a memorable journey. In Brazil, we have programs in the city of Rio de Janeiro. Once RCDP receives your application, it will immediately be forwarded to Brazil for processing. Our Brazil In-Country coordinator will then carefully review your application to ensure you get placed in the project that matches your criteria and your qualifications. Once the Brazil In-Country coordinator finalizes and forwards us the detail, we will immediately send it to you. The whole process normally takes 1-2 weeks. However, this can sometimes take longer. Once you receive the placement details, you can even call our Brazil office directly and speak to our In-Country coordinator and ask any questions that might prepare you for the trip. Preparation for a Brazil trip includes: reading about Brazil, vaccination, Visa arrangement, booking tickets. If you experience ANY problems, please call RCDP office. Once you purchase air tickets, they should immediately submit the flight details to BOTH RCDP and Brazil office. Volunteers should arrive at Galeao Antonio Carlos Jobim International Airport, Rio de Janeiro, Brazil. In Rio, one of our representatives will be waiting for you in the arrival lounge in the airport holding a placard with your name on it. This will happen without fail if you have passed on your travel itinerary to our office. If you want to be absolutely sure, you can call your Brazil office and talk to our In-Country coordinator. If your flight gets delayed or if you miss your flight and book yourself with a later flight, please let us know immediately by either calling our office. You must try to call first and then email the details if possible. Look at your placement details for all the contact information. If you cannot make any contact and no one receives you at the airport, look at your placement details, hire a prepaid taxi and go to the hotels recommended on it. Let the In-Country coordinator know your whereabouts after your arrive at the hotel or the next day. The coordinator will arrange a pick up later. Volunteers are requested to arrive one day before the start of program. If volunteers arrive more than one day earlier or remain after the close of their program, they will be responsible for their own for providing their own accommodation and meal. RCDP will arrange for the accommodation and meal of the volunteer throughout volunteer in Brazil program. Volunteers will stay either in a hostel or a volunteer house. The accommodation will be located in central Rio, in a safe and secure neighborhood. Volunteers will have to share their room with other volunteers of same gender. Breakfast will be served in the hostel. For other meals, you can either cook in the hostel (there will be utensils for you to cook) or you can eat out. Food in Rio is about 30% cheaper than in New York City. A meal of fejioda, which comes in large portion and will be more than enough for lunch or dinner, will cost you around US $5-10. There are also kilograma restaurants in Rio, where the food will costs based on the weight. While volunteering in Brazil, RCDP also offers extensive support for you to make you feel at home will volunteering. We offer many layers of support in Brazil if and when you require. Our country coordinator in Brazil is in charge of your volunteer program and the coordinator will be the main person supporting you throughout your program. The coordinator will call you or visit you (if this is possible) to see if you are happy and satisfied with your project. You will also have the coordinator's mobile phone number and you can call the coordinator any time if you want to discuss anything. Our project staff will also guide and help you throughout the program. You will meet the project staff daily during your volunteer work in Brazil. Our staffs at home base/hostel will also help the volunteers whenever there is any need. Volunteers will need to apply for a tourist visa. Please get a visa before arrive in Brazil. For details on getting a Brazilian tourist visa, please email us or inquiry with the Brazilian embassy in your country. What are the principle health risks? We recommend all volunteer/participants visit the Center for Disease Control's website (http://wwwnc.cdc.gov/travel/ ) for traveler's health recommendations. Your travel doctor will be knowledgeable about current epidemics and should be consulted. The following vaccines may be recommended for your travel to Brazil. Discuss your travel plans and personal health with a health-care provider to determine which vaccines you will need. Please change your currency to real after arriving in Brazil. You can do it in the airport or local banks. Avoid street money changers as they cannot be fully trusted. Visitors are also warned that other than US Dollars, it might be difficult to change other currencies. ATM machines are available at various regions throughout Brazil, especially in Lima and the airport, where the option to take out US dollars or Shelling is available. Do not arrive in Brazil without any cash as ATM machines may not be working properly or fail to accept your card. Check with your bank to confirm that your card will work overseas. Debit cards and credit cards are acceptable at major stores. Travelers' checks are exchanged at the banks. In most locations, you won't be able to exchange them. Debit card is the best way of getting the money out and ATM vendors are available through urban areas in Brazil. Visa, Master Card and American Express are accepted in large stores and hotels in larger cities. You can get by with $50 a day provided you are careful in taking your money out. Accommodation and breakfast during your project is free but if you want to explore Brazil and shop, budget accordingly. We keep in touch with our volunteers. Our staffs visit volunteers every 2 weeks. You are encouraged to contact us if you want to speak to us about anything. You will be provided with all the contact information. Internet cafes are available in Rio. You can also use international phone cards to call home. You will be provided with full contact details of our office in Brazil. You are encouraged to call us if you want to discuss anything. In addition, our program staff will visit you regularly to check your progress. Rio was once notorious for crime and criminal activities. But lately the police have cracked down hard on criminal activities and crime rates have gone down significantly. Rio is organizing soccer World Cup in 2014 and Summer Olympics in 2016 and the image they want to portray during the games is one of clean and violence free city. Volunteers should not worry too much about their safety. But there are some things you can do to ensure your own safety like not walking alone after dark or avoiding dark place, not visiting favelas without local guide or project people and not showing valuables openly in the street. Argentina is a treat for anyone wanting to experience diverse climate. From hot deserts, dry forest, humid savannas, rainforests to cold plateaus and icy mountains where snow remains all year, Argentina's got everything that nature throws at us. Typically though, the northern regions are hotter, while Patagonia and further south is extremely cold.